I’ve been watching FUSE more than usual lately – simply because they are the only decent music you can get on TV nowadays. In any case, they’re playing a lot of commercials for Sunkist orange soda. And the music (their website plays it) is just too groovy to resist researching further. After a quick google search, found out that its a song by Blackalicious from their album NIA. Its called Reanimation, and let me tell you, this is one funky pick-me-up hip-hop song. The lyrics are choice as well. 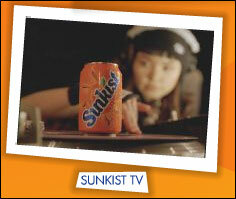 Go check it out on the Sunkist Soda website – click on Sunkist TV to view the commercial I’m talking about.